A young wid­ow try­ing to sur­vive, a ghost with an agen­da, and a boat they share. Cyd Den­linger wants to for­get her late, phi­lan­der­ing hus­band, keep her fam­ily from run­ning her life, and regain her com­mer­cial boat captain’s license. What she doesn’t want is to be involved with an old flame OR a ghost. But the ghost offers a trade that’s hard to resist. “Find my killer,” she demands. In exchange, Cyd will own the boat Snap­dragon. Easy for a ghost to offer some­thing she can’t use. Not so easy to solve a mur­der with too much help from fam­ily and friends. 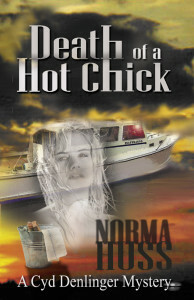 Not too safe either, espe­cially when Cyd won­ders: Was the killer’s tar­get his vic­tim, or her boat?